Haiti is on the brink of an era of mass extinctions similar to the time when dinosaurs and many other species suddenly disappeared from the Earth, reports a biologist at Penn State, who announced on Nov. 16 the establishment of a species-rescue program for Haiti's threatened frogs and other species, including captive-breeding and gene-preservation efforts. "During the next few decades, many Haitian species of plants and animals will become extinct because the forests where they live, which originally covered the entire country, are nearly gone," said Blair Hedges, a professor of biology at Penn State and leader of the rescue missions in Haiti and other countries in the Caribbean. "The decline of frogs in particular, because they are especially vulnerable, is a biological early-warning signal of a dangerously deteriorating environment, just as a dying canary is an early-warning sign of dangerously deteriorating air in a coal mine," said Hedges, who is also one of the world's foremost authorities on amphibians and reptiles. "When frogs start disappearing, other species will follow and the Haitian people will suffer, as well, from this environmental catastrophe." Hedges recently relocated 10 critically endangered species of frogs from Haiti to a captive-breeding program at the Philadelphia Zoo. One of these species already has begun breeding, laying eggs, and producing hatchlings in Philadelphia. 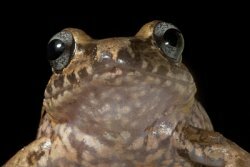 Hedges has discovered at least five new frog species during three expeditions to Haiti this year, but he was not able to find two species that may now be extinct because they have not been seen there for 25 years. His scientific descriptions of the new species will be published in future issues of research journals. The rescue mission led by Hedges is part of a new effort supported by the National Science Foundation to determine which species of amphibians and reptiles currently survive in Haiti, to pinpoint their locations, to discover any new species that previously were not documented scientifically, to relocate live populations of frogs for captive breeding, and to deep-freeze cells at Penn State. "Captive breeding and cryobanking are two efforts to preserve the species in case they become extinct in Haiti," said Hedges, who is one of the few scientists worldwide who have established cryobanking programs in their labs for endangered frogs and other species. Cryobanking involves the preservation of cells and DNA in liquid nitrogen that will permit whole-animal cloning, if necessary, in the future. "These are time-consuming and costly backup plans to save species, normally reserved for those species closest to extinction, as in Haiti," Hedges said. "The goal is to release offspring of rescued frogs in Haiti if and when their forest habitat improves." Hedges and the Philadelphia Zoo also are working with the Haitian government and non-governmental agencies to train Haitians in this conservation research so that they can develop the capacity to breed these species in Haiti. Frog species have been disappearing worldwide during the last 10 to 20 years, and one-third of the 6,000 frog species on Earth now are threatened with extinction. But 92 percent of Haiti's 50 frog species are threatened -- the highest percentage of any country in the world. Even worse, most Haitian frog species are officially designated as "endangered" or "critically endangered," the two highest levels of concern. "We found that as many as 26 species occur together in the isolated mountain forests of southwest Haiti, greatly increasing the threat of mass extinctions when the forests there are cut down," Hedges said. Of the 50 frog species in Haiti, two-thirds -- 30 species -- live only in Haiti and do not occur in the neighboring Dominican Republic. "Less than one percent of the original forest is left in Haiti, which is a lower percentage than in any other country that I know of," Hedges said. "There definitely is no other place in the western half of the world -- and some scientists would argue in the entire world -- where the extinction threat is greater than in Haiti." Hedges explained that the forests of Haiti are disappearing because the trees are being cut down to produce charcoal for the 10 million Haitian people who have few other sources of cooking fuel. "When you have a species that lives only in one mountain-top forest, and that forest suddenly disappears because you start harvesting all the trees for charcoal, then that species is guaranteed to become extinct along with all other species of animals and plants living only in that forest," Hedges said. "Virtually every truck you see on the rural roads is loaded down with bags of charcoal coming from the mountains, where people are cutting down the trees and making charcoal to be sold in the city of Port au Prince. The forests from some entire mountains now have been removed completely. In places, it looks like a lunar landscape, with nearly all the soil washed away and only the rocks and some weeds left behind." Hedges has found that trees are not being protected even in the national parks of Haiti. "The commander of the park guards in the largest national park told us that only 10 unarmed guards are working at any one time in the park but typically 200 teams of tree cutters are at work there, armed with machetes and other weapons." Recently a park guard in Haiti was killed by tree cutters. "The pressure for cutting down the forests is coming from a whole island nation of people needing cooking fuel -- a problem requiring economic and possibly engineering solutions and needing the help of major international conservation organizations and government agencies," said Philippe Bayard, president of the Audubon Society of Haiti and collaborator with Hedges in efforts to save Haiti's biodiversity. "Unless effective help arrives soon, it is inevitable that there will be mass extinctions, and I think they are in progress." Robin Moore, amphibian conservation officer for Conservation International, agrees. He joined Hedges and Martinez on the latest rescue mission. He points out, optimistically, that "despite the massive deforestation, the fact that the frogs are still hanging on, though barely, means that it is not too late to protect their habitat." The scientists emphasize that the loss of forests also is a catastrophe for the Haitian people because forests are their major source of energy and they are critical for their economy, agriculture and drinking water. Hedges, who has studied the genomes of diverse species worldwide in his laboratory research, is focusing his efforts in Haiti on preserving the cells and genomes of the endangered species there. Besides rescuing 10 frog species for captive breeding at the Philadelphia Zoo, he has cryobanked frogs and other species in his lab. One of the rescued frog species is the smallest one known on the island -- a species whose adults are the size of a small human fingernail. "A captive-breeding program is a huge responsibility. You have to feed the animals, breed them, and keep them going for years and years, possibly indefinitely," said Carlos Martinez, Amphibian Conservation Biologist for the Philadelphia Zoo, who accompanied Hedges on the recent frog rescue mission. "But the survival of these species may depend on this work, so it is well worth the effort." Hedges was impressed with the zoo's willingness to take on this challenge. "I am absolutely delighted that the Philadelphia Zoo generously agreed to accept all 10 species, and I consider it a huge success that so many critically endangered frog species are being captive bred and cryobanked." Ideally, a population should have at least 30 males and females to begin successful captive breeding, but some of these 10 species at the Philadelphia Zoo have fewer individuals. Hedges explains, "we were up on the top of a mountain that we might never get to again anytime soon, and we feared that this could be the last chance for the survival of this species, so we decided to at least try to breed them in captivity." He points out that, despite their limited habitat, these small animals occur in sufficient numbers to be unaffected by collecting efforts of the rescue team. Hedges now is looking for more zoos with the capability and willingness to host captive-breeding programs for endangered Haitian species, including reptiles, which he hopes to rescue during future expeditions. "Haiti has suffered a terrible earthquake and it is enduring a cholera outbreak and so many other environmental and human disasters, and now it is clear that Haiti also is suffering the beginning of a mass-extinction event that likely will affect many more species in addition to its frogs," Hedges said. "I would like to have hope that the destruction is going to stop and the forests are going to come back, but I have fears about what will happen to the animals and the people of Haiti unless something major is done very soon to resolve the life-threatening problems there." Hedges has set up a website, at http://www.CaribNature.org/ online, where he is posting multimedia information as well as links to conservation organizations that are working to solve the problems that are causing the species extinctions in Haiti and other areas of the Caribbean.